In preparation for this weekend’s premiere of the TW-drama Drunken to Love You, I hereby bring the detailed character synopsis for the main cast, and well as the plot outline (it’s a three-month marriage contract, yo!). It’s not terribly spoilery, especially since as a live-filmed drama I suspect the script for DTLY remains subject to change depending on how well received (or lack thereof) this drama is. It’s slated to be 15 episodes, and I hope that remains the final episode count, because I felt the extension for both Fated to Love You and My Queen killed a great first half and the second half become slighty loco dragville. Now let’s get to know the quirky denizens of DTLY, shall we? I’m even more enamored of this drama after reading this. He comes from a prominent family, with a world-renowned musician for a father, and an internationally acclaimed painter for a mother. Because his parents are constantly away, Jie Xiu grew up mostly alone in his big house. Facing an empty mansion, Jie Xiu does not understand what family really means…. The adult Jie Xiu ironically becomes an interior designer, and his talent allows him to quickly gain recognition and success. Jie Xiu finally gets up the courage to propose to his girlfriend, the famous model Avril, but she turns him down because of her career ambitions. It’s during this time he meets another person with the same fate as him, a woman named Lin Xiao Ru. The two lovelorn people get drunk, and end up getting married! During the subsequent time they spend living together, the house that was originally so cold and empty, because of Xiao Ru, starts to feel like a home…. Because of her family circumstances (poor), Xiao Ru is beautiful on the outside, but stingy and miserly on the inside. She takes coupons with her everywhere she goes. If she hears about a discount anywhere, she will drive half a day away just to get a good deal. All this effort on her part is so that her beloved family can live a good life. But this kind of hard scrabble life does wear Xiao Ru down, so when she meets a co-pilot who has the freedom to go anywhere he wishes, it’s as if Xiao Ru has met a man who can make her dreams come true. She immediately falls in love, and has a steady two year relationship with him. This relationship, with its time and distance constraints, utterly exhausts Xiao Ru. Facing Yi Xian (Kingone Wang), who time and again misses his promises and appointments with her, she keeps saying that it doesn’t matter, but the loneliness in her heart continues to grow…. In other people’s eyes, she has it all, looks and intelligence. She has beauty and ambition, and once she sets a goal, she must achieve it. She is adept at reading her surroundings and knowing what exactly to say at the right moment. In front of the cameras she is like a haughty queen, but privately she is like a fluttering butterfly, enjoying the adoration of the men around her. 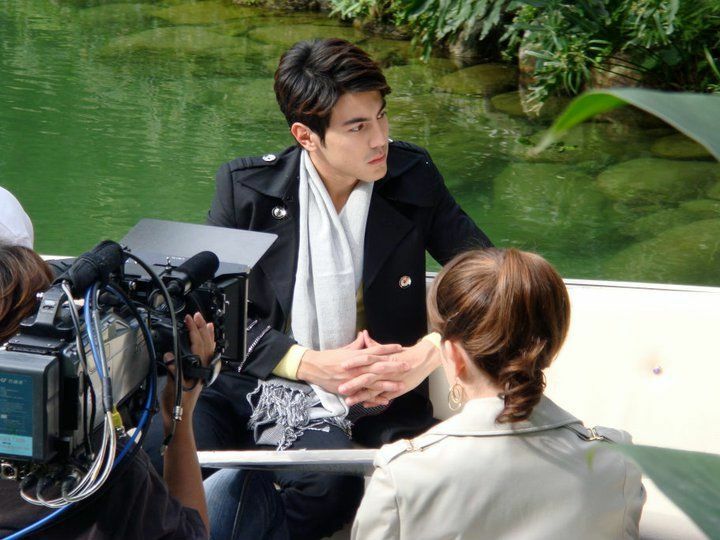 His hardworking attitude and stellar acting chops leads him to be respected and beloved by the media and his fans. He’s won many awards already at an young age, and is considered the most sought after young actor in Chinese entertainment. He is the first choice that all the actresses want to work with. He’s very reserved and rarely has any scandals reported about him. The reason is hidden in the loneliness that is in his eyes. Handsome and dashing, he’s got an outgoing personality and loves his freedom. As a co-pilot he can travel the world, and his experiences add to his allure. Sometimes he can be a polite gentleman, other times he’s like a playful child. He has the charms to slay all the ladies. He’s romantic and thoughtful, and what women consider an ideal boyfriend. Song Jie Xiu proposes to his girlfriend Avril but is turned down so that she can accept a movie role that will make her career. She believes that Jie Xiu will always wait for her. Lin Xiao Ru is waiting for her boyfriend Ren Yi Xian to whisk her away to Las Vegas for a quickie wedding that she’s long dream about, and Yi Xian knows that Xiao Ru is what he wants in his life and all he has left to do is marry her. But unexpected circumstances arise that force Yi Xian to give up Xiao Ru. The rejectees Xiao Ru and Jie Xiu accidentally meet at a bar, and what follows in the next 24 hours are drunken hijinks that leads to the next morning Jie Xiu waking up to his closet full of lady garments, another toothbrush in his sink, tens of voicemails and texts congratulating him on getting married, and a valid marriage certificate naming him as the groom and Lin Xiao Ru as the bride. He’s about to dissolve this farce of a marriage when Avril calls, asking him to stay married for three months until she can finish the movie. She needs him to be a married man during this time, and for them just to remain friends so that scandal doesn’t befall her. She promises that when her movie wraps, and Jie Xiu gets his divorce, she will go public about their relationship and accept his proposal at that time. THIS REMINDS ME OF CAMERON-ASHTON “WHAT HAPPENS IN VEGAS”, TOTALLY A CAMSHTON MOVIE hahaha 😉 awesome dude!!!! OMG…….. Thank You Bertha. I swear i was thinking about the movie i have watched when i was reading the synopsis. Yes you are so right, it does sound somewhat like What Happen in Vegas. Interesting.hope you can recap it as I rarely find a good tdrama recap.this drama sound promising. well that’s okay. i love it when the two main characters are living together. it’s like a guarantee that there will be hilarious moments between them.